An exhibition dedicated to the 100th anniversary of the great Azerbaijani composer, People's Artist of USSR, academician Gara Garayev will open in the Russian National Museum of Music on June 27. Museum visitors will be informed about life and creativity of national composer, Trend Life reported. Music lovers will learn about Garayev's studies at the Moscow Conservatory in Dmitri Shostakovich's class and the beginning of his pedagogical activity. The exposition will feature the story of the most significant works of the composer - the ballets "The Path of Thunder" and " Seven Beauties", music for the films "Don Quixote" by Grigory Kozintsev, "Goya, or the Hard Way of enlightenment " by Konrad Wolf, "Nizami" by Eldar Guliyev with Muslim Magomaev in a leading role. The portrait of Gara Garayev by friend, People's Artist of the USSR Tahir Salahov will become a central exhibit. "Tahir Salahov captured the composer in an atmosphere of concentrated meditation, invariably next to the piano, the work was done in a restrained minimalistic color scheme, which became an inspiration for creating an artistic decision of the exhibition," the Museum said. The exhibition will last until August 26. 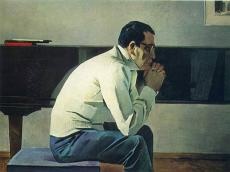 So, 100 years have passed since the birthday of a legendary national composer Gara Garayev. Garayev inherited his love of music from his parents. His father Ebulfaz Garayev was a famous pediatrician in Baku. Ebulfaz Garayev was known for his kindness and generosity. When patients were too poor to pay for treatment, he often left money under the prescription that he had written out for them.